The world gained a new appreciation for the dangers of lithium-ion batteries with the recent series of incidents related to the Samsung Galaxy Note 7. The truly ubiquitous technology, seen in everything from children’s toys to smartphones and laptops, has long been known to be quite dangerous if it malfunctions. Explosions and fires have always been right around the corner, and proper use, storage, transport, and disposal of these batteries is essential. Over the years, there have been reports of phones exploding in isolated incidents across the world, but the recently launched iPhone 7 series had stayed out of controversy – until now. 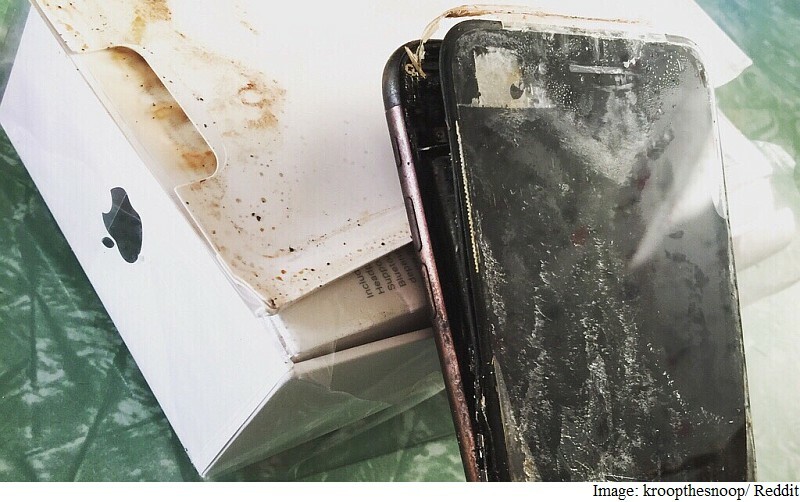 A Reddit user earlier this week reported a case of an allegedly exploded (yes, past tense) iPhone 7 Plus. Posting details for a co-worker, the user said the iPhone had exploded in transit, and that it was in that condition when received. If that is indeed the case, iPhone 7 Plus and iPhone 7 users across the world may just be able to breathe a collective sigh of relief. Unlike the case of the exploding Galaxy Note 7, the iPhone 7 Plus in this case did not explode when it was connected to a charger (or even turned on). It seems most likely the explosion was due to some form of transportation mishap, affecting the battery within. Also, unlike reports of an entire house or jeep going up in flames thanks to exploding Galaxy Note 7 smartphones, in this case, even the packaging (seen below) did not catch fire. Of course, no official report about why the explosion occurred has yet been released, and so the above speculation should be taken with a small pinch of salt. To recall, Samsung issued a worldwide recall for approximately 2.5 million Galaxy Note 7 smartphones it had already shipped when it discovered that was a problem with the battery in a significant number of units. Apart from the recall, the company had begun a replacement and refund program as well.